Delta Air Lines, the second largest airline in the world, engaged Kate & Co. to launch their upgraded Boeing 777 aircraft to the Australian market. The objective was to create brand awareness and secure positive media coverage on the new aircraft product and celebrate Delta Air Lines’ as a long residing airline in the Australian skies. And so, Kate & Co. embarked upon a highly strategic and tactical PR & events campaign. Launching the upgraded aircraft to media and industry stakeholders was a key opportunity for Kate & Co. to tell the Delta Air Lines story, and educate Australians on the brand and their central ‘Delta Difference’ message. The media outreach plan rolled out in strategic phases to ensure optimum coverage was secured throughout the campaign. From securing and managing one on one interviews for Delta Air Lines Vice President, Scott Santoro (attending from LA especially for this launch) and key travel journalists at The Australian, Traveller.com.au and broadcast title, Wayfarer Executive Travel. Kate & Co. also planned and secured pre and post publicity with Australian Actress, Jodi Anasta. In conjunction with a thorough media outreach plan, Kate & Co. produced and managed two launch events on consecutive evenings adjoining the inaugural flight of the Boeing 777. The first was a lavish sit down dinner with key travel and lifestyle media, as well as Sydney VIPs, held at View By Sydney – a venue in the cultural precinct of Walsh Bay with an iconic view of Sydney Harbour Bridge. Media in attendance included Sydney Morning Herald, Daily Telegraph, 7Travel, 9Honey, Vogue Living, Nine News and Stellar Magazine and more! Whilst VIP influencers included the likes of Australia's golden girl and Sydney socialite, Nadia Fairfax, travel and lifestyle vloggers Jade Tuncdoruk and Lachie Brycki and E! Entertainment reporter, Ksenija Lukich. 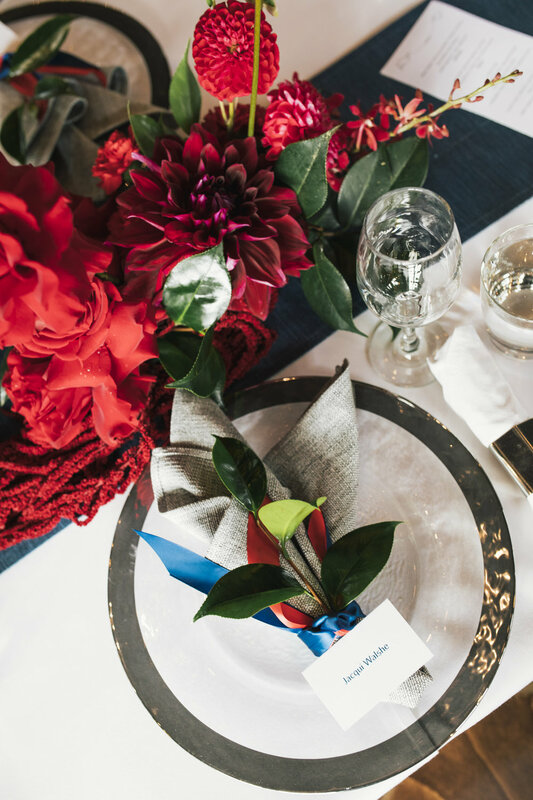 From the blue ‘runway’ carpet on arrival to the deep red and passport plum flower installation, the venue was dressed in Delta Air Lines branding with personal, hand crafted place settings and a distinct white balloon ‘cloud’ that guests had to walk through to reach to their seats. Whilst a saxophonist entertained the esteemed guests with his sophisticated beats, speeches were made, videos were played, and guests left feeling excited about the brand and its latest venture. The second event followed a similar styling route, however played to a larger audience of travel and aviation trade personnel. With that in mind, Kate & Co. restructured the venue format to a cocktail style evening with less official formalities. 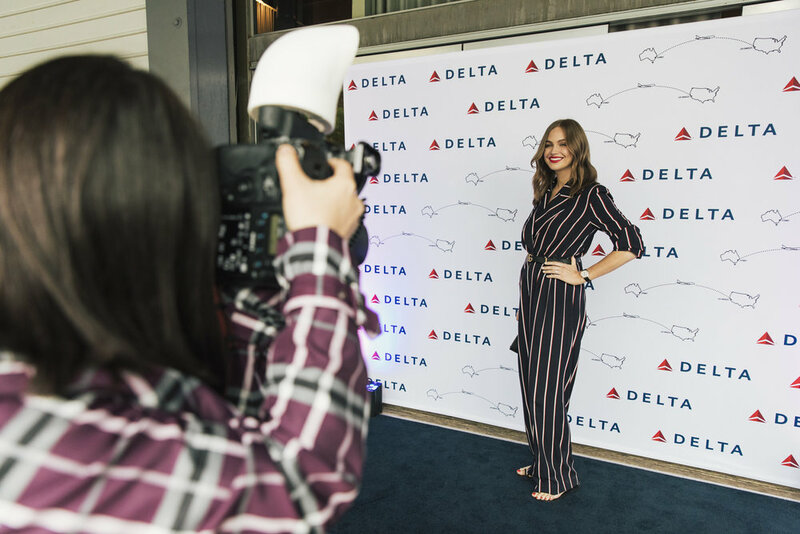 We erected a dress up photobooth to entertain guests, in addition to a lively saxophone, bongo and DJ set allowing guests to celebrate into the night, creating a memorable 10 year celebration for Delta Air Lines.